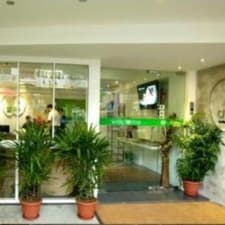 Apple Hotel Kuala Lumpur is a budget boutique hotel situated in the Jalan Alor area of Kuala Lumpur that features complimentary breakfast. Air-conditioned, non-smoking rooms are serviced daily and feature en suite bathrooms with power showers. Also included is a safe, a television with satellite channels and a telephone. Services and amenities offered at this hotel include complimentary Wi-Fi service, 24-hour reception, luggage storage and 24/7 security. A complimentary buffet breakfast is served each morning and guests can enjoy a meal at the rooftop cafe which serves a variety of local dishes. Low Yat Plaza, Farenheit 88, Berjaya Times Square and Starhill Gallery are only a short walk away from Apple Hotel Kuala Lumpur. Other nearby attractions include The Weld, Aquaria KLCC, Petronas Twin Tower and Festival City Mall. Public transportation hubs are only minutes away. Guests reported that the rooms at this hotel are spotlessly clean and the beds and furnishings are very comfortable. Staff members at this hotel go out of their way to make guests feel welcome and at home during their stay. They are always friendly and easy to deal with. Many services and attractions are located just outside this hotel while other major attractions, such as restaurants and shops, are within walking distance. Guests also reported that it is easy to get a cab near the hotel and a major subway station is only a few minute's walk away. Guests reported that the rooms at this hotel are very small. There is no room to walk around, there is no place to store luggage and personal belongings and it's very uncomfortable, especially if there is more than 3 people staying in the room. The walls at this hotel are not soundproof which means guests reported being able to hear everything going on outside and in the corridors and nearby rooms inside the hotel. You can hear people talking loudly, doors slamming and pretty much any other sound outside the room.